Time for a brand new challenge at House Mouse and Friends Monday Challenge. Three fabulous prizes. 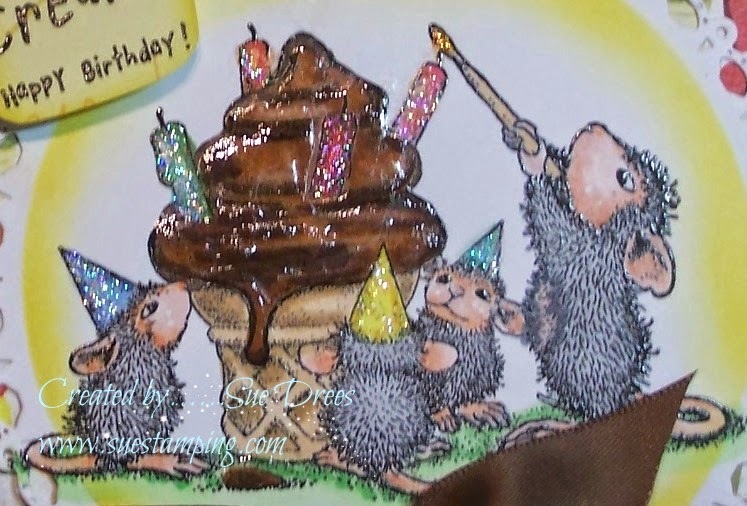 One of them can be yours and all you have to do is play along, make a card or project, using a House Mouse Design, Mouse, Happy Hopper or Gruffie image, and link it up on the House Mouse and Friends Monday Challenge Blog, for your chance to win. This challenge runs through April 11th at midnight EST. always amazed at what you come up with. WINNERS will now have their own post and will be announced on Tuesdays after New Challenges go LIVE! So please be sure to return on Tuedays to see if you are one of the LUCKY Prize WINNERS! Oh that cone looks good enough to eat even at 8:00AM. My stomach does not know what time it is, right? Seriously this is a truly fun, festive, delicious card. Love the inside as much as the outside. Have a fun day. Very well done Sue. I have always loved House Mouse. The party colors are great as is the coloring. The festive design follows right to the inside of the card. Wonderful. Oh, what a fun birthday card! I love the colors you used and that added sparkle is always a treat. Fabulous! 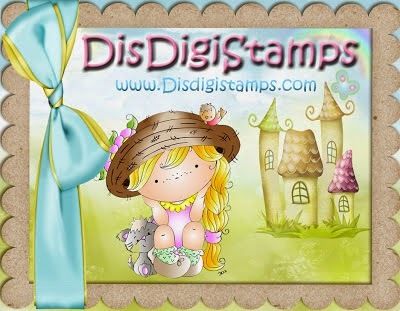 This is gorgeous Sue, I love the sweet image, beautiful colours and wonderful sparkle too. Such a delicious card! I want some ice cream now!! Love that image! Sue this cup cake looks good enough to eat...like something our Christine bakes for us on our birthdays...lol!!! How did you make this look so lifelike...amazing!! Your sweet mice look like they are having the time of their lives!! I love the card design!! Have a most wonderful day Sue!! Sweet card! I'd like to join those little mice and have some of that delicious looking cone. Love the vibrant colors of this card. A fabulous card Sue, such a fun image and lovely colour combination, I love how you have decorated the inside of your card as well. Hi Sue! I LOVE the fun sparkle, the cuts, the folds, the coloring. All of it! 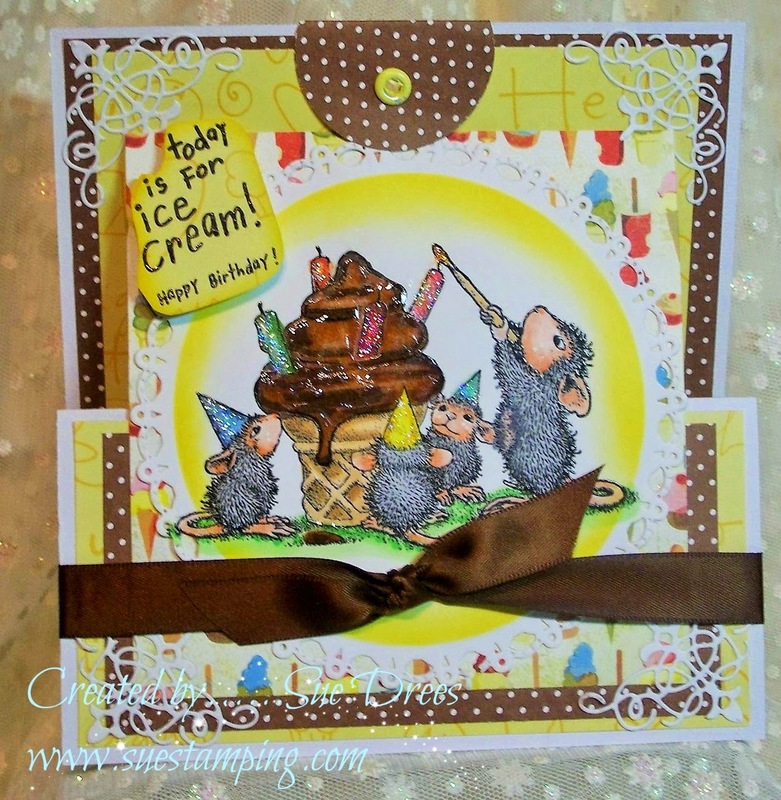 WOW-Mousey BDAY Design! !